This evening, we have for your viewing pleasure, my very first guest photographer. Ladies & Gentleman, meet Teka. She's the creator and maintainer of the fabulous Hershey Bears' blog Talk Hockey to Me and a fantastic photographer. By all means, wander on over to her blog and check out more of her fabulous work. 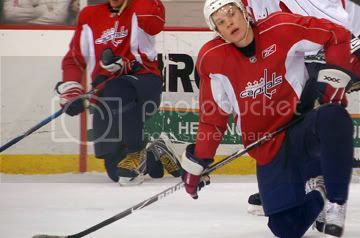 Semin looks like he's off in his own little world.